Mulled Wine (in Ginger Sugar-Rimmed Glasses!) | "Il faut goûter"
I dedicate this post to Abby. Abby’s great. Abby’s spunky, warm, and smart. Abby and I mulled over many poems together during college English major days. Now Abby wants my mulled wine recipe. This mulled wine is like the German favorite, Glühwein, which I found during travels has also become quite popular in wintry France (vin chaud). Mulled wine recipes are forgiving and flexible. I’ve made versions of this with cranberry juice and pineapple juice. I’ve used orange and lemon slices. Sometimes I add sherry, sometimes not. And you can adjust the amount of sugar to your tastes (or leave it out altogether!). In it’s simplest form, mulled wine is warm wine with spices. Start there and create a festive beverage you and your friends will crave each winter! Here’s the recipe for the mulled wine I’m enjoying tonight (in yoga pants, with knitting needles), but it would be equivalently excellent at your upcoming Holiday party (in fancy velvet dresses and ties or tacky festive sweaters!). In whatever atmosphere you choose to sip it, this winter drink will make you warm and undeniably fuzzy. Put everything in a large pot, and heat over medium-low heat for 1-2 hours so the flavors can blend. Don’t let the mixture come to a boil. Serve in mugs or heat-proof glasses, perhaps with a piece of orange slice to garnish. *Don’t forget to fish out those little cloves before serving! Sugar looks lovely on a dark mug too! 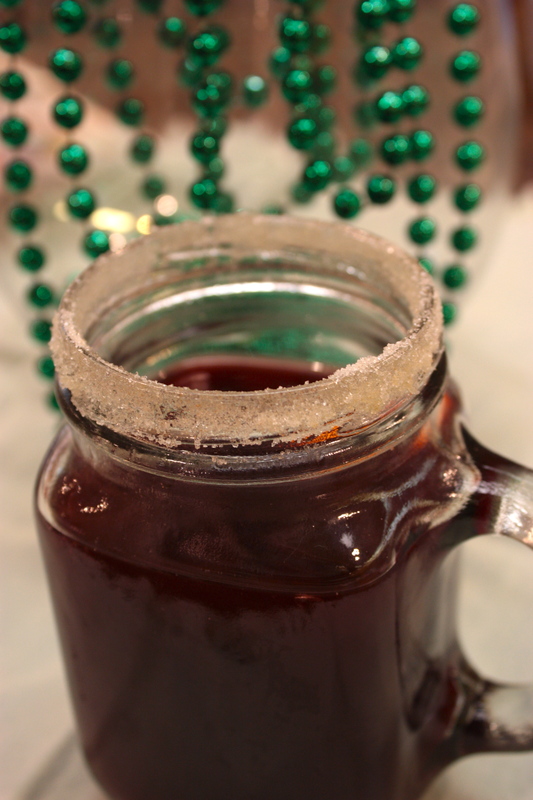 For a Ginger Sugar-Rimmed glass or mug, mix 1/4 cup white sugar with 1/4 teaspoon ground ginger in a bowl. With a slice of orange, carefully moisten the rim of your glass, trying to get an even rim. Dip the rim into the bowl of ginger sugar, then shake off the excess. 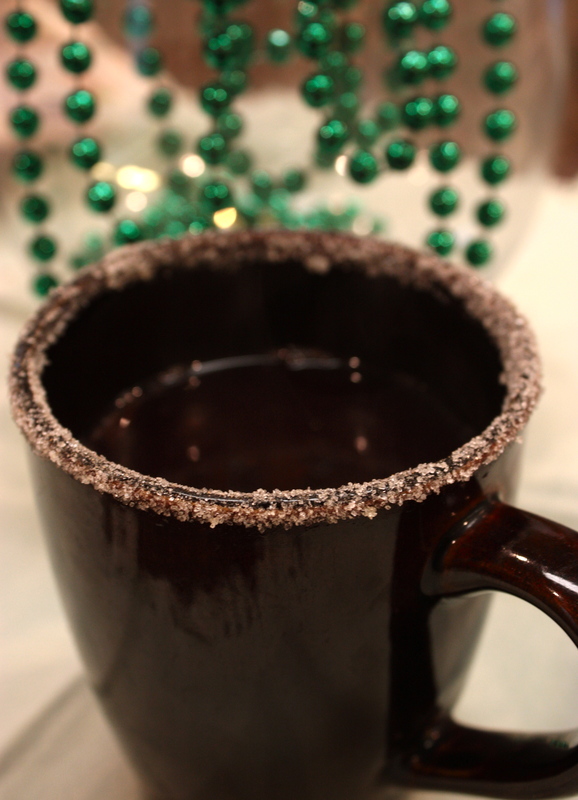 Now, that’s pretty and sparkly and easy, and just a bit sweeter with every sip! This entry was posted in Beverage and tagged beverage, Christmas, Cooking, food, gluhwein, Holiday, holiday drink, mulled wine, party drink, recipe, spiced wine, vin chaud, winter beverage by needtotaste. Bookmark the permalink. Awww. So complimentary! Merci! Can’t wait to try this and warm up a bit during these rainy days. I’ll let you know how mine turns out. Hee, hee. 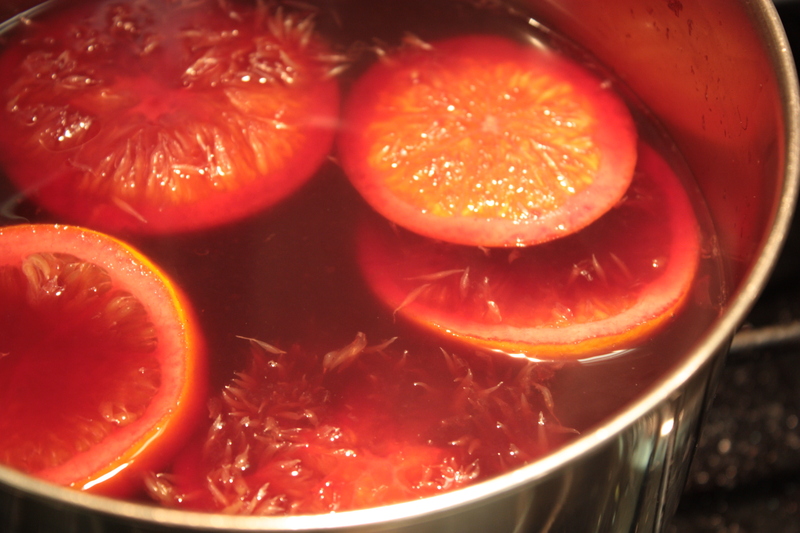 I have a mulled wine post going up tonight! I love your recipe and I have to do the sugar rim next time. I just used these old mugs we actually did get in Germany. Boy was that wine not good. It was an outside stand in Munich, but that’s all I remember. Ha, ’tis the season. Were they the Christmas market souvenir mugs?? Because I have those from Aachen and Cologne–and I packed them away and haven’t used them (for fear of breaking the lovely things)! I remember my Gluhwein being good, though. I don’t know about that game, but did you have Eierpunsch? That was a treat! Ah, excellent–I was thinking of making mulled wine for our dinner guests next week. Now I have a perfect recipe for it! Thanks!